Custom Made Bone Guitar Saddles By Chris Alsop. Made to your specification for all types of guitars: steel, classical, electric acoustic. integrated pickups and many more. 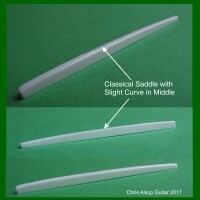 Saddles made to fit all makes of guitar including Martin, Seagull, Takamine, Ovation, Yamaha, Washburn, Fender, Tanglewood, Crafter, Admira, Freshman, Hofner and many more. 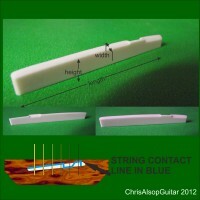 All guitar parts are designed and manufactured by Chris Alsop in his workshops in Derbyshire, United Kingdom.